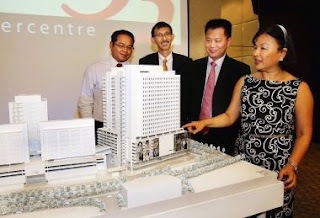 New offering: (from left) Jaya33 Sdn Bhd project director James Lee, property director Mike Kan, general manager Tan Kok Leong, and Toh at the unveiling of Jaya33 Cybercentre Tower 4 and 5. PETALING JAYA: The developer of Jaya 33 will be offering for lease two new office towers in a couple of months. Towers 4 and 5, built at a cost of about RM200mil, will be connected to the existing Jaya33 block with a bridge for cars and pedestrians. Its marketing director L.C. Toh said the two blocks, known as Jaya33 Cybercentre, had just received its Multimedia Super Corridor (MSC) status and boasted of several unique features. The nearest MSC-status office premises is First Avenue in Bandar Utama, Petaling Jaya. Toh said the new blocks offered the largest commercial floor space at 19,000 sq ft per floor compared to the conventional 8,000-10,000 sq ft. This will cater to the increasingly popular open office plan concept. The floor interior is laid out to house more people and to improve space efficiency from the conventional 100 sq ft per person to 75 sq ft per person. The floor design also incorporates additional space to accommodate any extra mechanical and electrical requirements for telecommunications and computer cabling. The main over-riding feature of the development is the incorporation of three data centre floors in one of the blocks. Tower 5 will come with purpose-built data centres on levels 9, 10 and 11 which will have a total of 57,000 sq ft.
Companies have the option to rent the suites of 1,450 sq ft. There are four suites to a floor. “The floor loading is 7kPA (kilo Pascal) to withstand the weight of generators. There will be dual sources of power supply as data centres run 24 hours,” she said, adding that the centre would meet the third tier of data centre specifications. Toh said the three floors would have specific technicalities of data centres different from normal office premises. These include self-control air-conditioning instead of a centralised one, security, power, heavy-duty floor loading, greater floor to ceiling height and other technical requirements. It will also come with fibre-optic network. “It will be cost efficient,” said Toh, and the rates would be between RM7.50 and RM8 per sq ft excluding equipment. “The rates are competitive,” she said, adding that there were some data centre leases which ran into double digits, including equipment and depending on power voltage requirements. Banks, for example, have their own data centres with the information of their clients which they cannot afford to lose. Security is important. The data centres were built in consultation with MyTeleHause Sdn Bhd and C2 Consult Sdn Bhd. 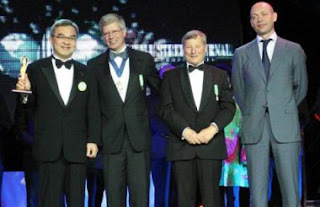 Winner again: (from left) Liew, FIABCI world president 2011/2012 Alexander Romenanko, FIABCI Prix d’Excellence 2012 president Laszlo Gonczi and St Petersburg Committee for Construction chairman Vyacheslav Semenenko at the awards ceremony. ST PETERSBURG (Russia): SP Setia Bhd is allocating RM1bil yearly to acquire new land for future development in the Klang Valley, Penang and Iskandar Malaysia. President and chief executive officer Tan Sri Liew Kee Sin said replenishing its landbank in the shortest time possible would place the company in a better position compared with other developers. He said the move was vital as the company would be able to continually launch new projects as the takeup rate for its properties was good. “Sufficient landbank is the life-line for us (developers) without which we could not properly plan our future projects,” Liew said after SP Setia's award winning development Setia Eco Gardens in Iskandar Malaysia bagged the FIABCI Prix d'Excellence award at a ceremony held here recently. The 2012 FIABCI Prix d'Excellence Awards saw 14 winners from seven countries, namely Malaysia, Singapore, India, Taiwan, Russia, Hungary and Switzerland. Liew said that among Kuala Lumpur, Penang and Iskandar Malaysia, getting new land in Penang was the most difficult due to the space constraint there. He added that those who managed to get land in Penang would go for high-density projects. “In the Klang Valley, the next growth centres will be within the Kajang and Semenyih areas,'' Liew said. He said the upcoming My Rapid Transit system would help boost property development projects outside the existing development centres in the Klang Valley. With the better accessibility and connectivity within the central region once the MRT system is completed, developers have started looking for land in new development centres. He said prospective buyers, mostly the first-time houseowners, would consider buying their first residential properties outside the existing growth centres as the prices were within their reach. On south Johor, Liew said Iskandar Malaysia would drive the property market in Johor many years down the road based on the progress and development taking place in the corridor over the last six years. “Iskandar Malaysia is more viable compared with other economic growth corridors in Malaysia,'' he said. Liew said the Johor property market also benefited from Iskandar Malaysia as demand for high-end residential properties was on the rise in south Johor. He said that apart from the Iskandar Malaysia factor, Singapore also played an important part in determining the economic growth in Johor. “It is a well-known fact that Johor and Singapore are intertwined in economic activities during good or bad times due to their close proximity,'' said Liew. Liew said the company was fortunate as all of its projects in southern Johor were strategically located within the flagship development of Iskandar Malaysia. Its ongoing projects are Bukit Indah with only 5% land left for development from the entire 610.67ha, Setia Eco Gardens and Setia Business Park (383.64ha and 50% still available for future development). Others are Setia Business Park II (107.24ha), Setia Tropika (299.46ha and 40%), Setia Indah (359.36ha and 10%) and Setia Eco Cascadia (110.70ha and 70%). “We'll continue looking for more land in south Johor,'' he adds. Liew said the remaining landbank would keep the company busy in Iskandar Malaysia in the next 10 to 15 years with a gross development value of RM8bil. He said on average, land prices in Iskandar Malaysia had appreciated when the company first came 15 years ago, the asking price was RM5.50 per sq ft and now it was between RM15 and RM20 per sq ft.
Liew said the opening of the Eastern Link Dispersal Expressway in April and upgrading of several roads within Tebrau corridor had improved connectivity and accessibility. Meanwhile, Setia Eco Gardens won its second FIABCI Prix d'Excellence Award within three years. Setia Eco Gardens had in 2009 won the FIABCI Prix d'Excellence award in Beijing for Best Master Plan. This year it emerges as the winner in the Specialised Project (Purpose Built) category for Eco Greens beating Green Pyramid and Ocenarium of Hungary and Taiwan's Taipei City Hall Bus Station Project. Eco Greens is a 11.33ha park complex in Setia Eco Gardens comprising a town park and the famed Eco Gallery, which features a green wall that has become an iconic landmark for the 383.64ha township. SP Setia is the only Malaysian developer to have won four FIABCI Prix d'Excellence awards Setia Eco Park in Shah Alam won for Best Master Plan (2007) and Best Residential (Low Rise) Development (2011) and Setia Eco Gardens for Best Master Plan (2009) and Specialised Project (Purpose Built). PETALING JAYA: Research analysts and property consultants have mixed views about developers that have been buying sizeable parcels of land recently, as the real estate market has slowed down and prices are relatively reasonable. “It is a good time to acquire land when the market is slow. Some property developers may just be able to get a bargain price for their purchases,” said property consultancy CB Richard Ellis (M) Sdn Bhd executive director Paul Khong. Khong told StarBiz via e-mail that real estate sellers would also be more realistic concerning prices, as there were not too many buyers around. He pointed out that the property sector was moving slowly back to a “buyer's market” and the principle of “cash is king” would rule again. In recent months, property developers such as Mah Sing Group Bhd, SP Setia Bhd, WCT Bhd and Hua Yang Bhd have been actively expanding their land bank particularly in the Klang Valley. Last week, Mah Sing announced that it was paying RM333.26mil or RM18.55 per sq ft for 412 acres targeted for a mixed township near Bangi, Selangor. SP Setia recently acquired 21.3 acres freehold land in Penang for RM185.6mil, and said this was for a mixed residential development project with a gross development value (GDV) of RM1.1bil. 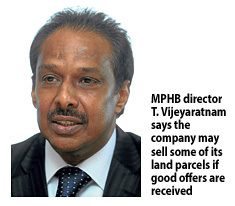 Meanwhile, WCT recently acquired two parcels of 468 acres and 57 acres in the Klang Valley. WCT executive director Choe Kai Keong had told StarBiz that the land costing RM450mil has a potential GDV of RM5.2bil. The 468 acres in Rawang, Selangor would be developed into an integrated township with an estimated GDV of RM1.2bil, while the 57-acre in Overseas Union Garden in Kuala Lumpur is planned for a mixed development worth RM4bil. Hua Yang also has been acquiring small parcels of land in the Klang Valley since last year. Hua Yang, which is known for developing residential properties in the affordable segment, recently agreed to pay RM15.2mil for 21 acres of freehold land in Ipoh, Perak. “Prices and sales of properties have obviously slowed down in 2012 as the number of buyers has been halved, with stricter bank lending guidelines. This is rather sensitive in the mid-high and high-end segments (such as above the RM3mil category) of the residential market,” said Khong. Khong said property developers were now moving quickly to look at larger land banks to develop new projects, and were looking at cheaper locations where there was still demand from the mass market in the mid and lower-mid sections. He also noted that the recent land sales were centred in secondary locations outside the city centre, but were in reasonably “good locations” and were in respect of big parcels where the developers could develop the “evergreen” landed segments again. Khong pointed out that regardless of market conditions, property developers needed to take a long term view about their land bank. However, one property analyst contacted by StarBiz said there were concerns that developers might be too aggressive in expanding their land bank. “In good times, when the property market is hot, developers can increase their gearing without much worry as they can launch and sell properties quickly. Now, the market has cooled and they should be careful about increasing their gearing too much,” he said. Maybank Investment Bank (IB) Research said in a recent report that it took a neutral view of SP Setia's recent land buy in Penang. However, Maybank IB noted that SP Setia's net gearing was still very healthy, as this was expected to increase to 0.14 times post-acquisition of the Penang land (from 0.08 times as at January 2012). Meanwhile, Kenanga Research said it took a neutral view of Mah Sing's recent land buy near Bangi as the deal is expected to result in the company's net gearing reaching 0.6 times (from the 0.3 times in the fourth quarter of 2011), based on an assumed 70:30 debt-equity financing. “This has exceeded our comfort level of 0.5 times net gearing,” said the research unit. However, Kenanga Research said Mah Sing's expected net gearing of 0.6 times is manageable amd should fall below 0.5 times over the next two quarters, on the back of continuous billings. 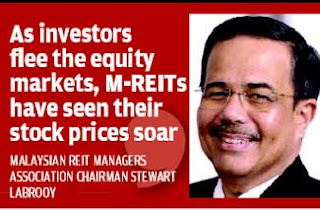 PETALING JAYA: The continued volatility in the global stock markets is expected to generate renewed interest in local real estate investment trusts (M-REITs) in the medium term, Malaysian REIT Managers Association (MRMA) chairman Stewart LaBrooy said. With stock markets expected to be in for a correction, he said the narrow trading bands of M-REITs would absolve them from the shocks in the global markets. “In the current volatile global environment, we have been witnessing a flight of capital to dividend stocks with low beta, such as real estate investment trusts. As investors flee the equity markets, M-REITs have seen their stock prices rising to new highs with a number of them providing their unitholders with double-digit returns in 2011. We believe we should also see strong returns for 2012,” he told StarBiz. Labrooy said the M-REIT market's liquidity and depth would improve with new REIT listings like the upcoming Mid Valley Megamall and Gardens REIT by IGB (IGB REIT). He added that 2011 saw the market capitalisation of listed M-REITs rose to above RM15bil, adding much improved liquidity to the stocks. “The listing of IGB REIT, expected in the second half of this year, could be even larger than the Pavilion REIT. The market is still waiting for details to emerge on the size of the listings although it has been estimated at around RM4bil,” he added. Labrooy said there was still a high level of interest in M-REITs among institutional and retail investors, and the IGB REIT listing would be no exception. In a recent report on the M-REIT sector, RHB Research maintained a “neutral” rating on the sector. It said the current valuations of M-REITs suggested that there was limited room for yield compression. “We see limited upside for the key larger REITs Pavilion REIT, Sunway REIT and CapitaMalls Malaysia Trust. Some value is seen in Axis REIT (due to potential bumper dividend post asset disposal) and Al-Aqar Healthcare REIT, which despite its smaller size offers more reasonable yields,” it added. “We estimate that the listing yield will be around 5.8% to 6%,” it added. Labrooy, who is also Axis REIT Managers Bhd chief executive officer, said many of the M-REITs were trading at a premium to their net asset value (NAV) making non-dilutive capital raising possible. This has resulted in many M-REITs returning to the market to raise fresh equity to expand their portfolios and provide their unitholders with higher dividends. He said institutional investors especially the big pension funds and insurance funds were opting for M-REITs especially for their cash dividends. However, he said that despite the substantial cash stashed away in fixed deposits and savings accounts that only generated yields of 1.2%-3.3%, interest from retail investors in REITs was just slowly coming around. To address this situation, he said the MRMA was initiating some programmes to educate retail investors on M-REITs. On prevailing uncertainties in the market, Labrooy said things to watch out for this year included external shocks coming from economic and policy developments in the eurozone, rising China-US trade friction, China's slowing economy, escalation of social and political tension in the Middle East, and expectation of a snap election in Malaysia. He said the main concern would be the unfolding eurozone crisis as banks there would have to boost their Tier-1 capital ratio by 9% by mid-2012, and this could lead to a liquidity crunch in the second half of the year. “Meanwhile, with the ebbing of inflationary concerns, the positive news is that the region's monetary policy has now moved from inflationary containment to a focus on growth. This has led to policies that have seen the maintaining of record low interest rates that are providing additional liquidity into the banking system,” Labrooy said.